For websites in Middlesex, England. This is a massive website all about Hayes & Harlington. Explore our extensive photogalleries of pictures of Hayes and surrounding towns and villages, past and present. Pictures of local landmarks, streets, schools, pubs, churches, scout groups and much, much more! A website for the busy and prosperous town of Uxbridge in the ancient county of Middlesex, in the London Borough of Hillingdon. A website for colourful, multicultural Southall, Middlesex, in the London Borough of Ealing. One of the biggest and busiest local discussion forums in London! Special sections for tracing lost friends and memories, plus FREE adverts section for goods for sale, goods wanted, jobs, accommodation, property for sale, flat shares, rooms to rent, pizza delivery, plumbers, decorators, jobs & training and much more! West London Chat is part of our project to expand HillingdonChat to a wider area. Colourful website for local scout group. Huge site for former pupils of a local primary school. Nationally and internationally renowned site for fans of AEC, Builders of Londons buses and a huge range of lorries and coaches, which was based in Southall, Middlesex and exported its goods around the world. Campaigning website exposing actions by local authorities that residents aren't too pleased with. Cafe Estrela do Norte is an excellent Portuguese cafe in West London, serving traditional Portuguese fare along with cappuccinos, teas, sandwiches and full English breakfasts! Open every day except Monday till 11pm. The premises are licensed, meaning you can enjoy a Portuguese beer or some wine, spirits or licquers with your meal. 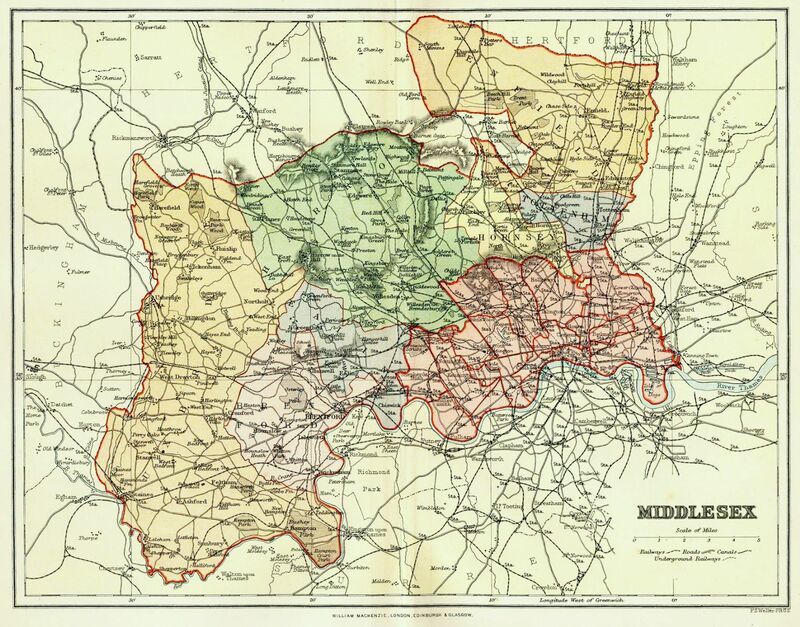 Middlesex is an area in England, mostly covered by Greater London. It is one of the 39 historical counties of England. It includes the City of London, which was self-governing from the thirteenth century. London's northwestern suburbs steadily covered large parts of Middlesex, especially following the coming of the railways. The administrative and historic boundaries around Middlesex diverged very early on, with the recognition of the City of London as an independent county borough. In 1888 much of the area became part of the County of London - the present-day boroughs of Camden, Hackney, Hammersmith and Fulham, Kensington and Chelsea, Islington, Tower Hamlets and Westminster were removed. During the next few decades the county became almost entirely urbanised by suburbs of London. Towards the end of the period, many of the boroughs in the area were demanding independence from Middlesex County Council as county boroughs, which if granted would have left Middlesex County Council controlling an area with three distinct and unconnected fragments - in the west, the south-east and the north of the county. 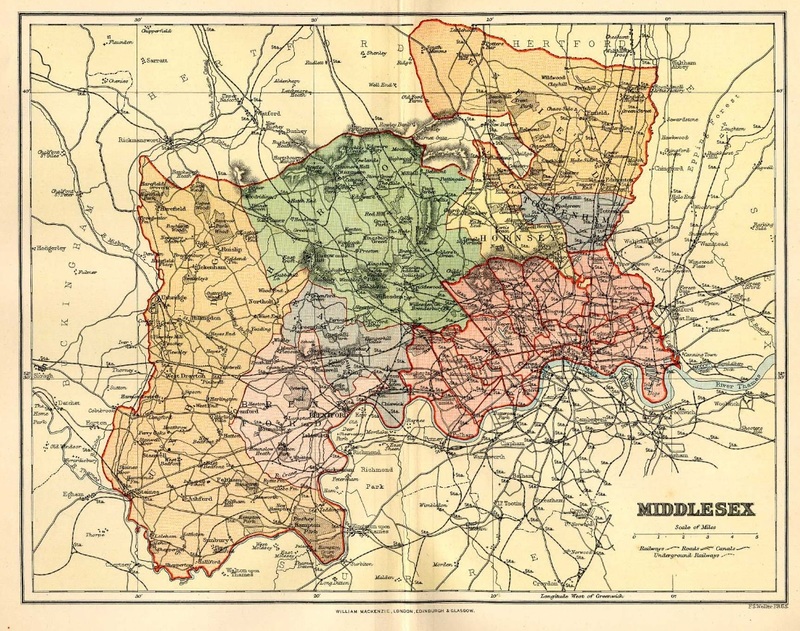 Instead, in 1965, nearly all the remainder of Middlesex was subsumed by the new Greater London except the Potters Bar district; which was ceded to Hertfordshire, and the district of Spelthorne, which were ceded to Surrey. The greater part went to form the new London boroughs of Brent, Ealing, Enfield, Haringey, Harrow, Hillingdon, and Hounslow. Middlesex is still used as a placename, and exists in the name of such organisations as the Middlesex County Cricket Club or Middlesex University. Royal Mail guidelines now leave the use on letters of the historic county, administrative county, or no county at all up to the personal preference of the addresser, and Middlesex is consequently commonly found on addresses outside the London postal districts (and sometimes, even within). From an organisational point of view the Royal Mail does however recognise the existance of an area called Middlesex as one of the Postal counties of England but confusingly it is not identical to the historic county boundaries - not only have large sections formed part of the London postal district but elsewhere the borders occasionally follow a different course, such as the village of Denham which is in both the traditional and administrative county of Buckinghamshire but in the postal county of Middlesex. In the area around Richmond upon Thames and Twickenham, one bank of the River Thames is often referred to as the "Middlesex Bank" , with "Surrey Bank" for the opposite side of the river - this identification is especially useful where the river flows in a north-westerly direction thus making the terms "north bank" and "south bank" somewhat confusing.